She packs New York City jazz clubs and gets standing ovations at Carnegie Hall. She teaches master classes in Hollywood and has thrilled audiences from England to Australia. Marilyn Maye might be starting her ninth decade, but she has no plans to slow down. Why should she? The Kansas City icon that Johnny Carson dubbed “Super Singer” is having the time of her life. Today she’s booked solid and has the energy of a singer half her age. It wasn’t always this good. Three marriages to alcoholics hit sour notes. And when rock ’n’ roll exiled The Great American Songbook to the back of the popular music bus, her career didn’t hit the heights it otherwise might have. But Maye is a survivor. For a paycheck, she voiced a 1960s TV commercial for Lincoln Mercury. She did concerts, worked small clubs and theaters and once even sang at a private party from under a stairwell. Then, in 2005, something unexpected happened. 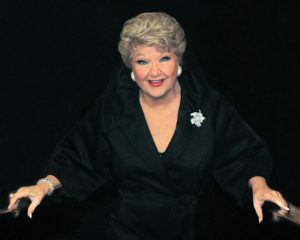 At age 78, Marilyn Maye staged a comeback. Invited to perform in New York for the first time in 16 years — for a tribute to Jerry Herman, the Grammy-winning composer of “Hello Dolly!” — she didn’t know what to expect. “I walked in and thought there would be my lawyer and three other people,” she joked. “But it was packed! In New York they do their homework . . . and they knew me! Her dynamic performance lead to rave reviews and a revamped career. Maye can hardly believe it herself. Maye, whose daughter, Kristi Tucker, teaches Broadway singing in Kansas City, has an encyclopedic memory for every club, theater or city she’s ever played. Jardine’s in Kansas City. Starlight. Quality Hill Playhouse. The Birdland Theatre and Rose Hall at Lincoln Center in Manhattan. Dino’s Backstage in Philadelphia. Iowa’s Lake Okoboji, where she has played for 62 years straight. How many can she name? How much time you got? For Maye, the key to connecting with an audience is to sing to them, not for them. But it’s not just the singing the critics love. They also praise her disarming humor. Once, a couple came 30 minutes late. “Oh, you’ve missed so much,” she said. Then, after signaling the band, she raced through song highlights at warp speed. If you like Kansas City Friends of Alvin Ailey, consider thanking lederhosen, the polka and a high school German teacher. Tyrone Aiken’s German teacher to be exact. Aiken, 56, is Ailey’s chief artistic officer, who over the last 28 years has helped create and expand the dance group’s education and outreach programs. That lead to a lifelong interest in dance. That’s what Aiken has tried to be in Kansas City. The group celebrates its 35th anniversary in May. Aiken, a former dancer, is particularly proud of his work with the Ailey Camp program. In the last 30 years Ailey Camp has helped 3,000 students in Missouri and 1,600 in Kansas and has been replicated in 10 cities across the country. Aiken has not only developed many education programs, he has helped craft a strategic plan to land a million dollars in new funding for even more programs. One of those, “Ailey in Your Neighborhood,” would allow the group to take dancers into neighborhoods for short “pop-up” performances, and fund a symposium on race, place and diversity. For Aiken, getting older has not dimmed his creative flame. Rita Blitt still laughs when she tells the story.Decades ago the award-winning Kansas City artist had one of her drawings turned into a sculpture. She supervised as workmen installed the gigantic jigsaw puzzle outside a shopping mall in Rockaway, New Jersey. Just then one of the men looked down. “It doesn’t fit!” he hollered. Blitt furrowed her brow, then hollered back. For Blitt, 87, there is nothing more fabulous than having spent a lifetime with art — nothing funnier, nothing more inspiring or satisfying. 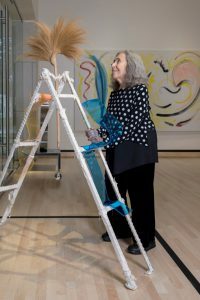 Whether it be her two-handed line drawings that explode out of her in a burst of channeled creativity, her sculptures, which can be seen from Israel to Singapore, her spontaneous drawings, her paintings or collaboration with New York choreographer David Parsons on short films, it is the joy she can never forget. Some of Blitt’s pieces also will be on display from mid-March to mid-May at the ArtsKC gallery, 106 SW Blvd. As of this writing, the regional arts council expects Blitt and David Parsons, founder of the New York-based Parsons Dance Company, to team up for an artist talk in Kansas City in the Spring. When Blitt met Parsons, who has Kansas City roots, in the 1970s at a children’s dance recital, she predicted he could be a star. In the next three decades she collaborated with him a handful of times, including on the six-minute film “Caught in Paint,” which won 16 awards and was invited to more than 130 film festivals. The film shows Blitt in front of a large, clear Mylar canvas, excitedly painting swirling lines as if dancing with her hands. Later, photographer Lois Greenfield captures images of Parsons’ dancers as they leap behind the art, perfectly mirroring the energy of Blitt’s passionate lines. Another film, “Finding Center,” inspired by her pastel ovals, is being shown around the world. Blitt’s ovals are projected large behind Parsons’ dancers. Blitt’s film “Visual Rhythms” shows how music and dance inspire those lines. Much of Blitt’s talent is in revealing things that already exist in nature, but often remain hidden — ephemeral and hard-to-define concepts such as love, beauty, joy, movement, wonder, intensity, curiosity, honesty and passion. Kansas City artist and writer José Faus didn’t have all the advantages. But creativity finds a way. His mother left him when he was 6 to be raised by his grandparents in Colombia after she went to live in America. She and her new husband sent for him and his brother three years later. Young José didn’t speak much English besides a few words he picked up watching “Bonanza” on TV. It didn’t matter. Faus had a creative fire burning inside him. 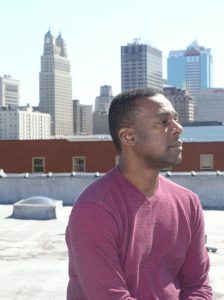 He not only fell in love with the music of the English language, he earned a bachelor’s degree in creative writing and journalism at UMKC. 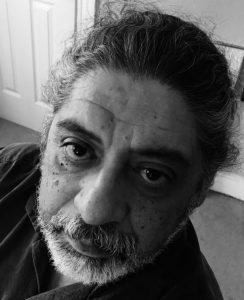 He wrote two books of poetry, won writing awards, helped found the Latino Writers Collective and even became the president of the board of directors of The Writer’s Place, a local literary center, library and gathering space. But inside, another creative fire burned. As he played with words, he also played with lines, shapes and colors. He became inspired by the works of painters Joan Miro and Arshile Gorky. And at UMKC he earned another bachelor’s degree — this one in studio painting. He completed colorful community murals in Argentine, downtown KCK and the River Market. One of his longest is on Metropolitan Avenue between 32nd and 34th streets. In Pressroom Studios in downtown KCK he creates vibrantly colored abstract works. This artistic duality has defined Faus’ life. Today, at 62, both endeavors remain essential. “It’s the way I can look at the world and come to terms with the things around me,” he said. His murals celebrate communities. His poetry can be pretty. “(But) sometimes it’s this primal scream of rage,” he said. Patrick Dobson, an author and history professor who has known Faus for nearly 40 years, said Faus is anything but hard-edged. Faus embraces creativity in every form.